WORKING IN BLACK AND WHITE AGAIN was refreshing (things have changed since my darkroom days). It was wonderful to revisit how satisfying it can be to deliver an image using the basic elements of composition and value. I am still in love with the magic of color and who wouldn't be, living in New Mexico, but I suspect I will be doing more black and white as well. 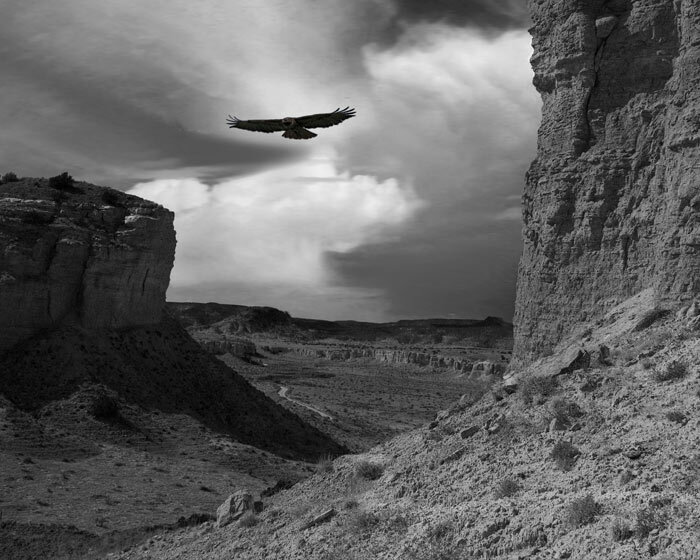 The images below were first seen at Arte de Placitas Gallery in November, 2012. All are archival pigmented ink prints on Canson Baryta Photographique paper. The steep trail down from Guadalupe Ruins in remote Sandoval County southeast of San Ysidro provides a birds eye view of the terrain for miles around. The mesa-top ruins are a small Chacoan outlier, probably located there because they could see anyone approaching from miles around. This red tail hawk is not enjoying the scenery; he's just looking for lunch. 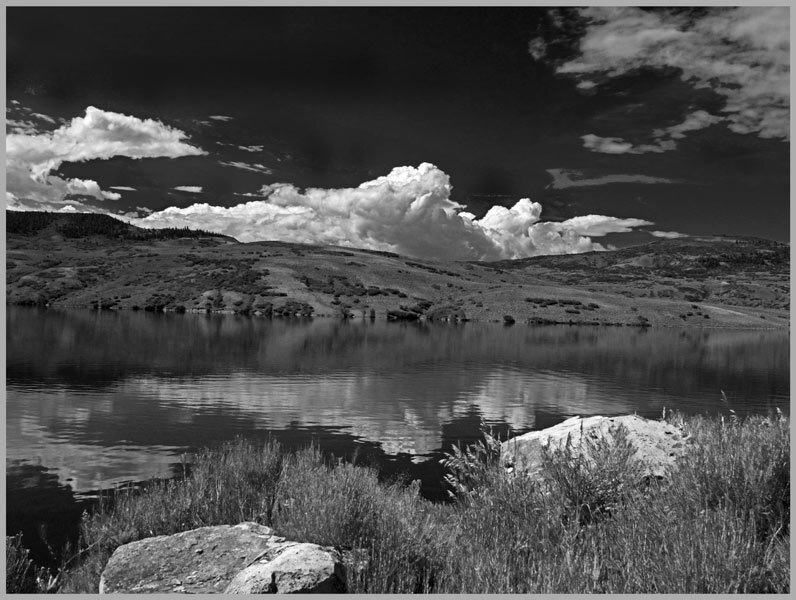 Running full bank to bank, the Gunnison River below Black Canyon of the Gunnison in southwest Colorado provided a perfect surface for reflecting the summer cumulus clouds. 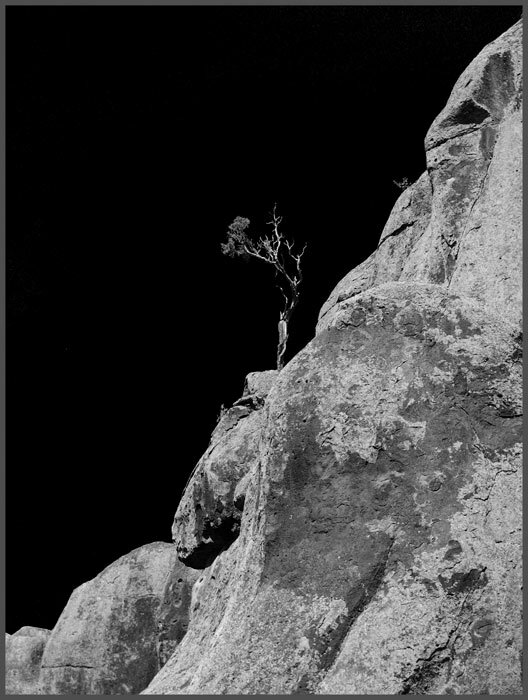 It was a peaceful scene, following a visit to the dramatic narrow and steep Black Canyon of the Gunnison that is difficult to photograph well unless you are hanging off the rim with a rope. Near the summit of Mt. 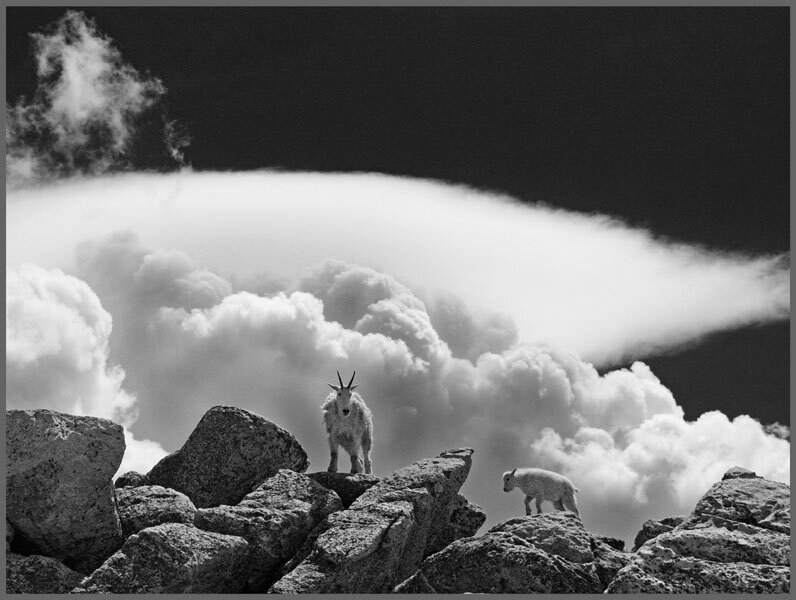 Evans in Colorado, the highest auto road in America, these mountain goats posed on the rocks above us at over 14,000 feet for several minutes before scampering off. On the drive to the summit you pass a 2,000 year old Bristlecone pine forest and are likely to see bighorn sheep, marmot and pika. 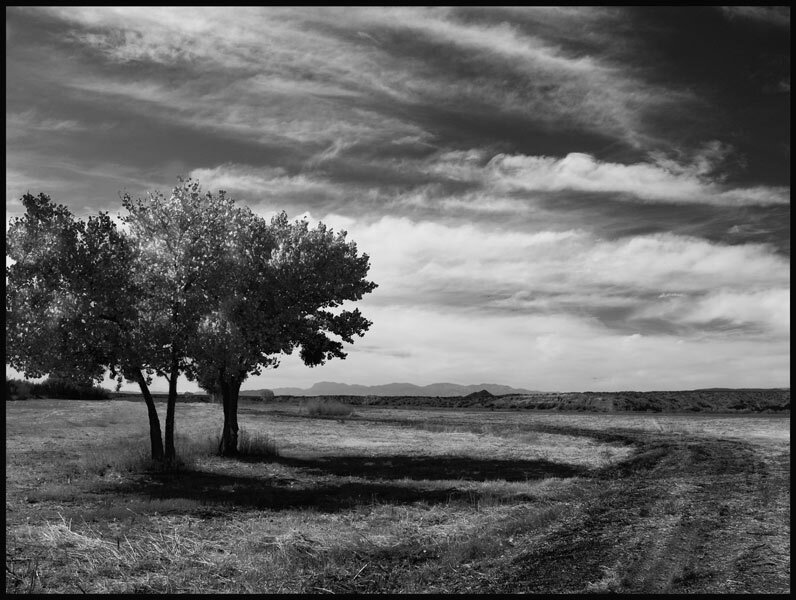 This lonely dirt road is at Bosque Del Apache National Wildlife Refuge in south central New Mexico, named for the Apache who often camped along the Rio Grande there. Its 57,331 acres are refuge to a large variety of migratory birds including cranes and geese and is the year-around home to ducks, hawks, eagles, coyote, cougar, deer and more. 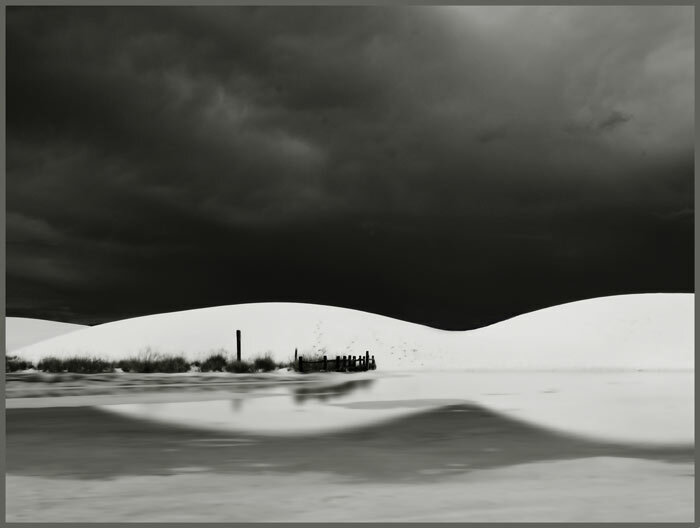 I was disappointed to arrive at White Sands National Monument in southern New Mexico in the rain, and it had been raining heavily all night. But I was soon rewarded with one of those uncommon shots ... the sand dunes reflecting in the water filled parking lot. I found the shapes both powerful and sensual. Located at El Rancho de las Golondrinas, this morada is a replica. 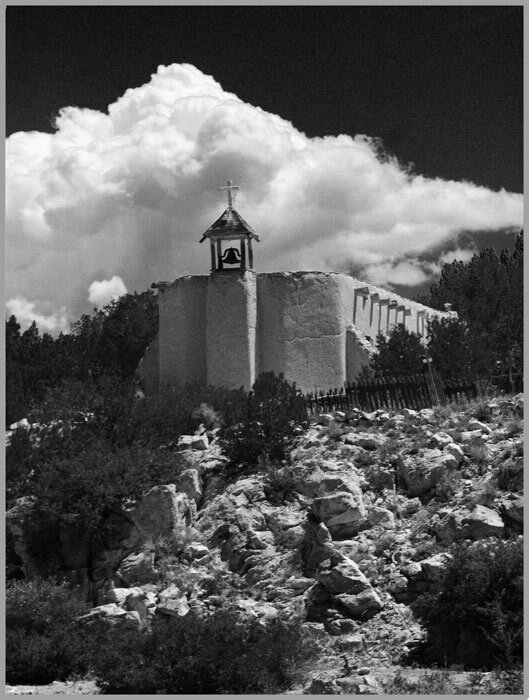 But it is accurate in design and the spirit of the moradas found throughout New Mexico and southern Colorado where Los Penitentes come together for prayer and to offer spiritual and social aid to the community. They still gather in these meeting houses (moradas) and are known for their secrecy, songs of worship (alabados) and their ascetic practices. 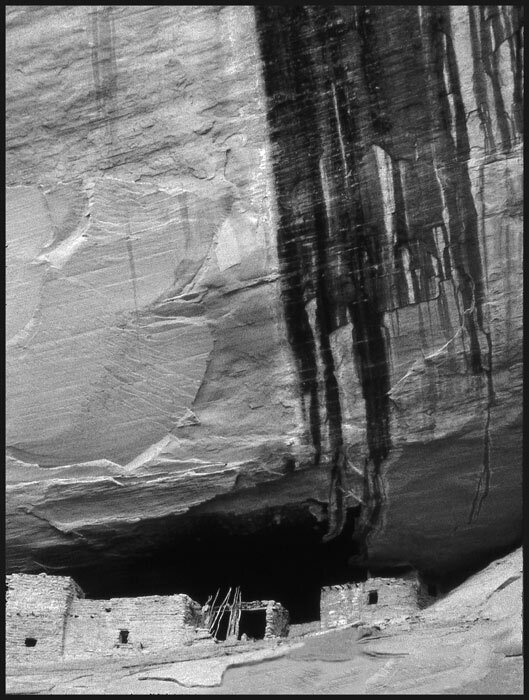 Kiet Siel (Kįts’iil), which stands for "broken house" in Navajo, is a well-preserved Anasazi cliff dwelling located in a branch of the Tsegi Canyon in the Kayenta region of Northeastern Arizona. The site was first occupied around AD 1250. At its peak, it is believed that 150 people inhabited this site. Kiet Siel, along with Betatakin and Ts’ah Bii’ Kin and the Navajo National Monument were declared a national monument in 1909. The ruin can be reached on foot, a hike of about eight miles. We were accompanied by a Navajo family who carried the food and all our gear on horseback. Hermanos who often visited this canyon in the 1800s and early 1900s, the narrow canyon also surprises you with a painting of the Virgin of Guadalupe high above the trail below. The September day we hiked the narrow trail among berry bushes and scrub oak, my overriding thought (other than the spectacular scenery) was "this is bear country".